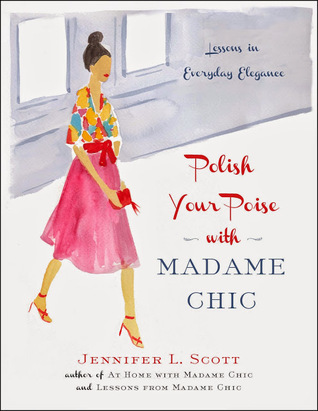 Polish Your Poise with Madame Chic by Jennifer L. Scott is helping me get my life together. I admit it, I need help. I’m usually one of those folks you see out at the grocery store in their pajamas. With comfy boots to match. Hair in twists looking like Ms. Celie from The Color Purple. Yeah… le sigh. Anyway, I decided to give it a try. I mean, a little help to polish my poise doesn’t hurt. Set to be released in October, Madame Chic per Jennifer gives plenty of relevant, good advice. I’ve been putting the lessons I’ve learned to use and can honestly say that I do feel better about myself. The advice covers many areas, including how to behave at work, social settings, and even how to behave in our cars. I particularly liked the sections about dressing. And yes, Jennifer even talks about appropriate bedroom attire too. Anyway, as I stated, I’ve been following the rules and have began dressing up for work! Usually I just roll up in there… I mean, I am blessing them with my presence! But now I take time to dress for me, and that makes me feel good. I admit that this is work, and everyday isn’t perfect. I mess up all of the time, but like the advice given in the book, I acknowledge and move on and try to do better the next time. So folks, give this book a shot! You might learn something new.